Start with a clear destination in mind. The 7 Habits of Highly Effective People was first published in 1989 by Stephen Covey. This book presents an approach to being effective in attaining goals by aligning yourself to what is called “true north.” It can be described as an internal compass that most human beings carry with themselves. The seven habits of effectiveness are based on principles and they bring the maximum long-term beneficial results possible. Habits 1 and 3 will help you achieve private victory (reaching personal goals) while integrating habits 4-6 in your life will allow you to reach public victory (team success). The seventh habit is one of renewal and continual improvement. “I am not a product of my circumstances. I am a product of my decisions” is a quote that Covey used to convey this habit practically. Being proactive is not the same thing as being reactive. The former describes an inner feeling powered by your own desires while the latter is about reacting to outside circumstances without inner reflection, drive or initiative. The main difference between proactivity and reactivity is the space of our freedom to choose our own response. Start with a clear destination in mind. Covey states that we can always use our imagination to develop a certain vision of what we want to become and consequently use our conscience to choose the values that will guide us. It is rather easy to keep yourself busy and we work hard to achieve victories, promotions, higher income and recognition but the challenge lies within evaluating the meaning behind being busy. Are the things we focus on intently are really what matters to us? A great leader never puts the things that matter the most at the mercy of things which matter the least. This habit is where you develop an action plan. While the second habit is a leadership habit, this one is a management habit. Doing this in an effective way means setting priorities for the most important things first. If you have not taken a full responsibility and clearly decided what you want in life, the priorities you set cannot have a deeper meaning to you. As Covey asserts, “to go for win-win, you not only have to be nice, you have to be courageous.” To reach quantum effectiveness levels, you must learn how to work with others. Thinking win/win requires quite a paradigm shift in thinking for many people. The corporate culture is based on competition and it is not a bad thing. Adopting this thinking approach is the first step towards understanding that someone does not always have to lose in order for you to win. To be a truly influential person, you must first be influenceable. For instance, when people communicate, they tend to think about what they will say next without any kind of effective listening. This is what Covey refers to as “dialogue of the deaf.” It is very important to listen actively and empathetically while trying to truly understand and see the world from the other person’s viewpoint. This habit is the capstone of all other previous habits. When you successfully supply all the previous habits and especially habits 4 and 5, synergy will occur naturally. Synergy happens when the whole is greater than the sum of the parts. This happens in nature when plants share one root in order to grow and flourish. When this is applied to the corporate world, the result of the cooperation will exceed the sum of what each of the members could have achieved on their own. This is the habit that helps a leader continuously improve. It is also of self-renewal as it encompasses and supports all other habits. Just like any tool that requires regular maintenance in order to function at its peak, you (the saw) must be regularly renewed and sharpened to remain effective. Make a list of activities that would help you continuously grow on a mental and professional level. At the end of every week, evaluate your performance and try to recognise where are the pitfalls. 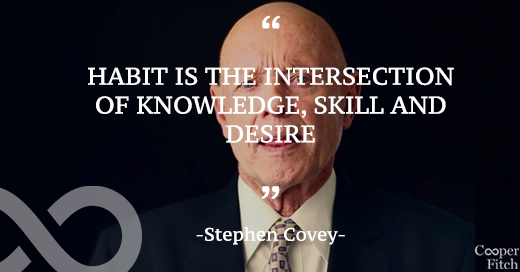 Habits can be defined as the intersection of skill, knowledge and desire. They are powerful factors in our lives. Because they are consistent, often unconscious patterns, they constantly and daily express our character and defines our effectiveness. These habits once attained, will become the basis of a person’s character creating an empowering centre of correct maps from which an individual can effectively solve problems, maximise opportunities and continually learn and integrate other principles in an upward spiral of growth.